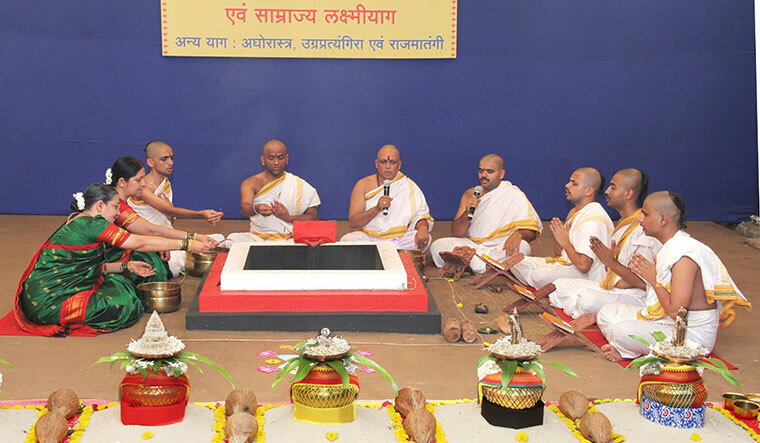 On a prayer: Sadhaks performing yajnas at the Sanstha ashram on Athavale’s birthday. THE SANATAN SANSTHA works in extreme secrecy,” says Vasant Bhat, one of the main priests of the Ramnath temple in Ponda in Goa. Bhat has been battling a case filed by the Sanstha—he has been accused of pelting stones at the sadhaks. “It all started when I launched a campaign to ban the Sanstha and remove its ashram from Ramnathi village,” he says. Bhat started his campaign after the 2009 Madgaon bomb blasts in which the Sanstha’s name popped up. “I organised a huge march against them, and even got the gram sabha to pass a resolution against the ashram. We don’t want them here,” he says. The ashram is situated in between two famous temples—Shanta Durga and Ramnath. The locals’ main grouse was that the Sanstha was trying to intervene in the local festivals and rituals. “They wanted us to celebrate religious festivals as per their dictum,” says Bhat. The villagers came together to form a Janjagriti Manch and it demanded a ban on the Sanstha. Bhat was asked to head the movement. “That is why they filed a case against me,” he says.